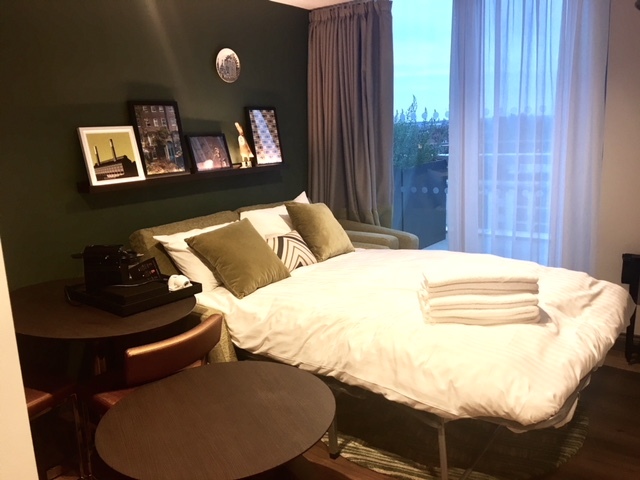 One of the biggest openings this year for serviced apartments in London has been the Residence Inn Kensington and we were particularly excited about this new aparthotel for its great rates and central London address in Earls Court, which happens to be very close to our HQ in Hammersmith. It is a really good balance of apartment living and hotel services, in my opinion. 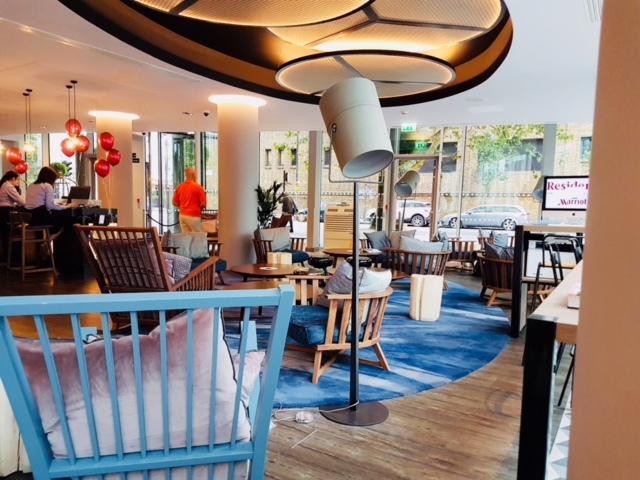 The round-the-clock reception is a feature I really like compared to some serviced apartments where you may not see staff on-site at all. 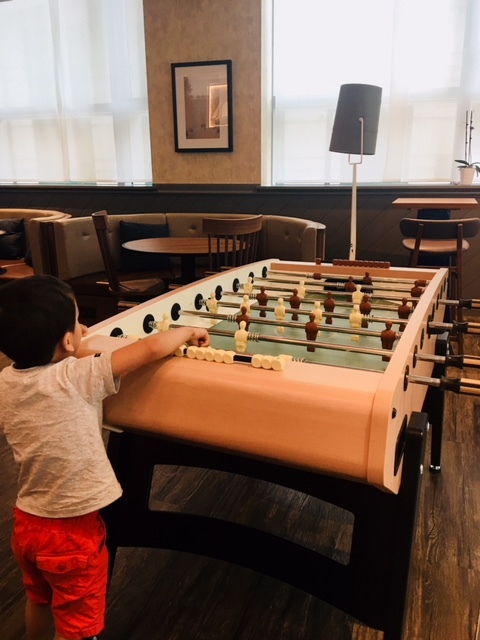 The high glass windows and lighting make the lounge, games room and bar areas very bright and the variety of seating provides ample room to relax, have a meeting, play Foosball or enjoy a coffee in front of the fire feature and TV. 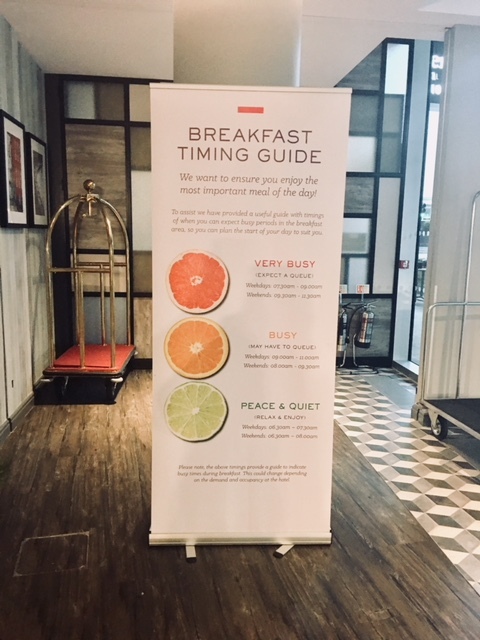 Breakfast which is included with every stay can get very busy so there is a poster explaining the busiest times. They put out quite an impressive selection so expect a variety of bread (buns, rolls and sliced) pastries (croissants, danish pastries, cinnamon rolls), yoghurts, fruits, juice (apple and orange), ham, salami, cheese, spreads, teas and coffees and plenty of cereal to choose from including nuts, museli, coco pops and cornflakes. Three hot items were available including vegetarian sausages, baked beans and bacon. In addition it would have been nice to have an egg dish. 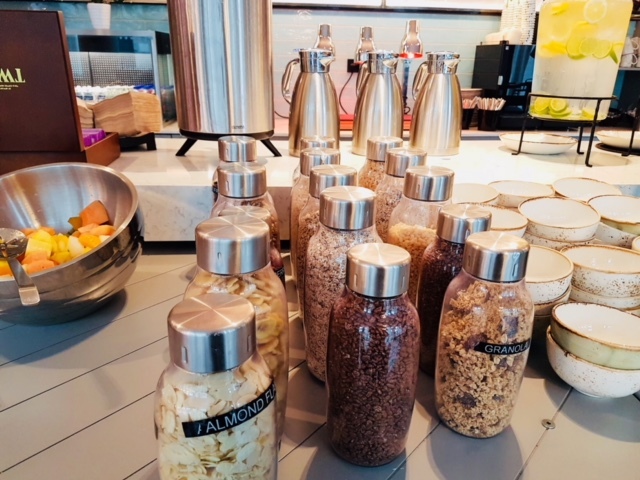 You could also choose to have a breakfast box delivered to your room if you want to skip coming down at all. 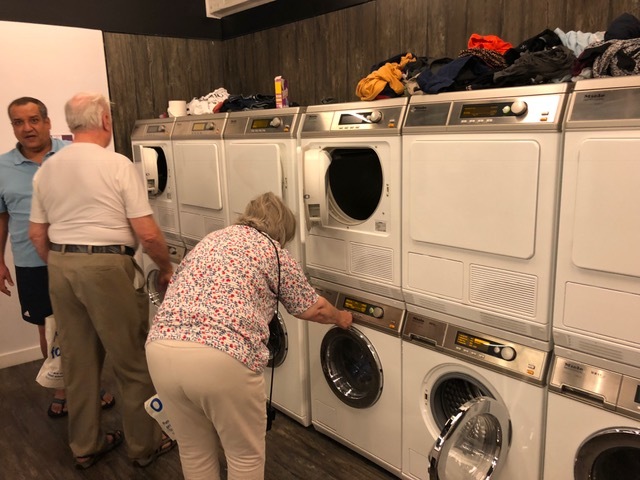 The laundry room which sits right next to the well-equipped gymnasium have quite a few Miele washing machines and dryers with drying clothes racks too. 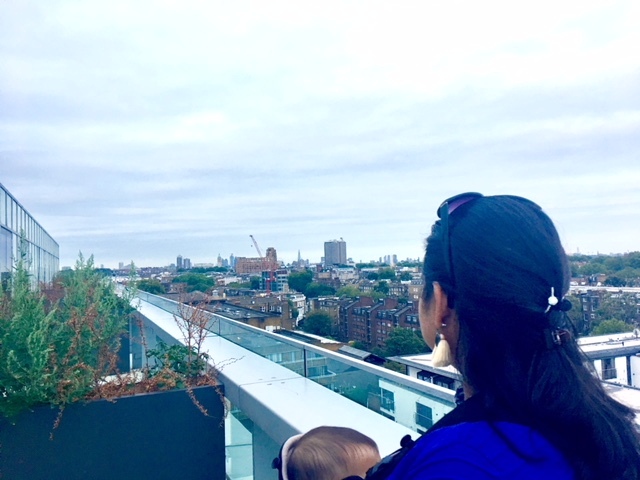 We checked into a Deluxe One Bedroom Suite with City Views which had a fantastic terrace with superb views across the city, all the way to the London Eye and the Shard! Floor-to-ceiling windows brings the light in during the day and thick blackout curtains helps darken the room at night in spite of the bright city lights outside. The decor is very cool and contemporary with a bold colour scheme and many references to London in the quirky prints, posters and photographs. 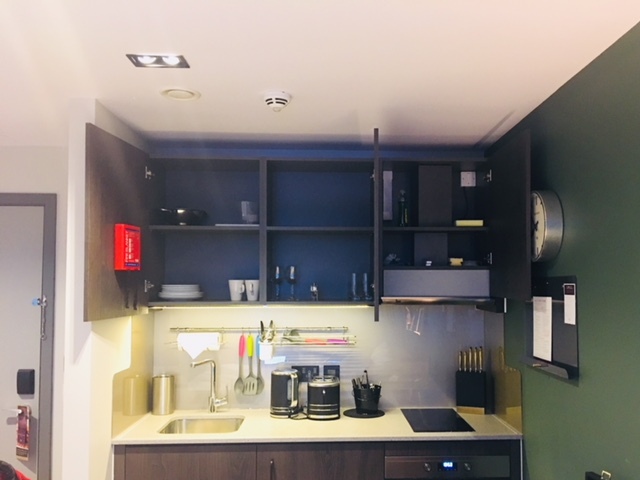 The bedroom is a bit smaller than I expected as there is not enough space to comfortably open a suitcase around the bed, but to compensate for that there is a good sized wardrobe and more shelving space as you enter the apartment for coats and bags, including a suitcase stand. 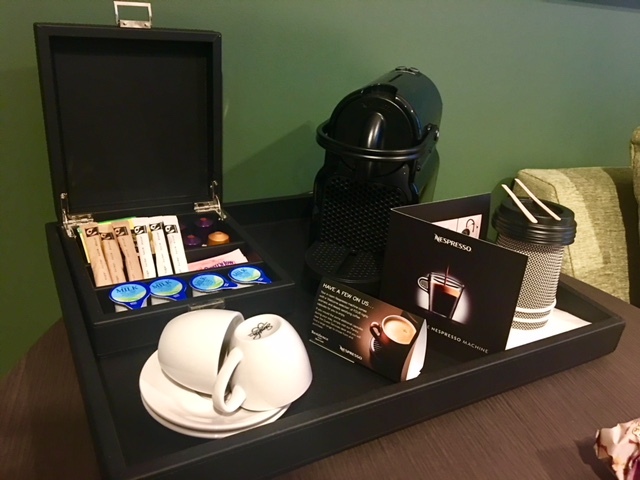 All the useful traveller essentials are provided like a tea/coffee station (including a Nespresso machine with a couple of coffee pods), a good quality hairdryer, an iron and ironing board, a safe, USB slots for charging and generous sized toiletries. The self-catering kitchen is one of the best parts of choosing this kind of accommodation. Plates, cups, glasses, wine glasses, cutlery, cooking utensils are all provided for you to dine-in at your own leisure. Dishwasher tablets, cleaning up liquid and a scrubber are also placed in the cupboard to help you with the washing up. We loved having a little freezer which was handy for our midnight icecream treat. There are easy instructions on how to use the appliances in the kitchen area, WiFi, phone and A/C. The beds are lovely, soft and just perfect to retreat to at the end of the day. The sofabed was also certainly one of the most comfortable ones I have ever sat/slept on and good enough for two children, an adult and a child, but maybe not two adults. The SMART TV is amazing with cable TV, digital TV, Youtube and a few other apps. It was also great to have two TVs, one in the living area and one in the bedroom, so we could keep the kids entertained separately too. 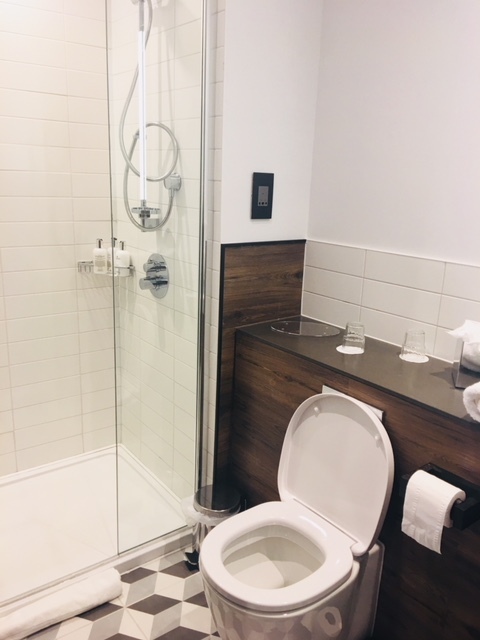 The bathroom has sliding doors, a tiled shower area, large toiletries, spare loo rolls, LED mirror lights and soft white towels. Earls court is a busy multicultural London neighbourhood with a vibrant mix of international cuisine (British, Persian, Thai, Chinese, Italian, Japanese, Indian and more), local supermarkets, convenience stores, drug stores, banks and coffee shops. The biggest advantage is having the massive 24/7 Tesco on your doorstep. This is so useful when you have children and may need to stock up on anything from nappies, snacks, milk to all your groceries and household essentials. This particular Tesco also sells clothes, gifts, alcohol, flowers and has a cafe and bakery. 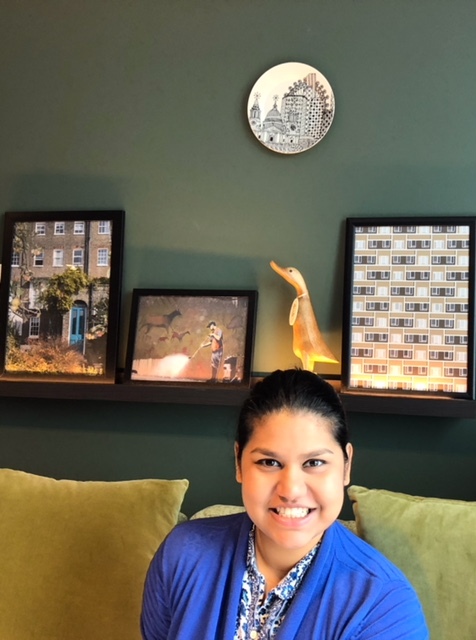 It scores top marks for it well connected tube station, Earls Court (10 minutes walk away) with the Piccadilly line (straight line to Heathrow Airport) and the District Line. You've also got many buses that run from here, including buses to Westfield mega mall (10 minutes away) and High Street Kensington, which are major shopping hotspots. 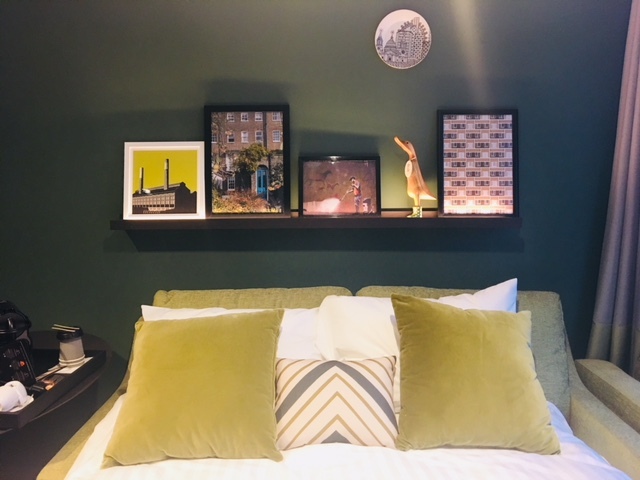 In terms of leisure and sightseeing, you've got Holland Park, Kensington Palace, Kensington Gardens, Natural History Museum, Hammersmith Apollo and the Olympia Exhibition Centre all within easy reach. 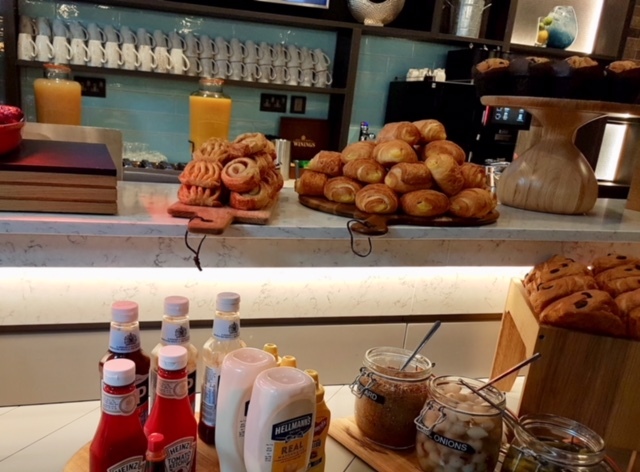 The Residence Inn Kensington is a great value choice for London visitors and certainly a top consideration for anyone wanting hotel-style facilities, home comforts, the convenience of a major supermarket next door and good transport links. We wanted to make sure that some of the initial teething issues faced by clients during the launch phase were no longer being experienced and we were pleased with the overall touchpoints throughout our time in-house. A big thanks to Jake Seage at Cycas Hospitality for making the stay possible.